Oppo started with its N-Series handsets in India and had forayed into other range of smartphones in the country. Within the short span, the company has reached out to many smartphone consumers. We have used many Oppo handsets, and Mirror 5 was the recent device of the company that we reviewed. The most important thing that we have noticed about their devices is the consistency in offering solid build smartphones. We have the Oppo’s latest R7 Plus in our hands, and it has gone under several testing conditions in our hands. And now we would like to share our detailed thoughts on the R7 Plus. Read our review of the device. The Oppo R7 Plus pretty much takes design cues from its little sibling, the R7. That phone has a great design and it only make sense that iteration carry forward the same course. The metal build unibody design is the signature aesthetics of R series handsets. There are metallic curves around the body, where the chamfered edges extend along the boundary of the device. Metal smartphones are no jokes; you just have to love them. And Oppo R7 Plus is nothing less than a great phone with impressive build quality. But one thing is for sure that it is an unusually large smartphone, I mean very big. Though, the thickness of 7.8mm might help, but it still would be complicated to handle it on one hand for most users. It might not be a big issue for those who prefer large smartphones. Though, it can still raise the issue because of its slippery body. We thought the buttons are placed conveniently on the left and right of the device. The power button is on the right with microSD and SIM slot, and volume rocker buttons on the left. The 3.5mm audio jack can be found on the top edge while microUSB port is placed on the bottom edge. On the front, you have the usual setup of the screen, selfie camera, LED notification light, proximity and ambient sensors. When you turn the phone, you’ll notice the main camera, LED flash, laser aided-focus, fingerprint scanner and a single speaker. At 6-inch, this smartphone from Oppo comes under a range where even the phablet term couldn’t describe it correctly. You might be thinking why I’m harsh to the large size? Well, because it’s not that friendly on my hands and pockets. But people with bigger paws would enjoy the size. 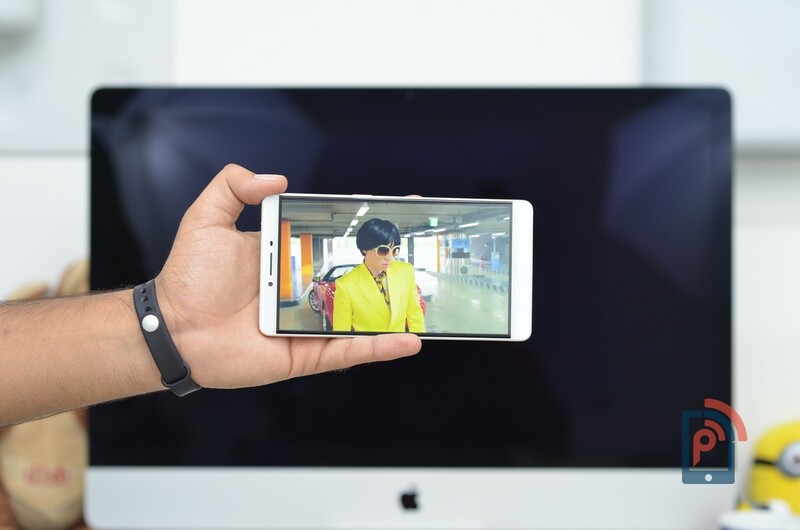 The large screen size can be a big plus to users who wants on-the-go entertainment and aren’t looking to carry an extra gadget or so. The display offers 1080p resolution, which translates to a pixel density of 367 PPI. It’s not the most PPI count on a large screen device, but you do get a display with good color saturation. When it comes to the legibility in the sunlight, the device offers good viewing angles only if you have increased the brightness levels. While the display is switched ON, you’ll feel like the bezels are non-existent. But that feeling fades away as soon as you switch off the screen and notice that there is a black border around the display. Don’t feel deceived its just design. The interesting part on the display front is that you get some display options in the Settings area that might be able to help you in optimizing the screen for better viewing or say for safer viewing. Under display tab in Settings app, you get Eye protection options. It helps filter out the blue light in the visible spectrum that is apparently harmful to the eyes. There are three options: low, medium, and high. I don’t suggest you keep it as your default display, but it would certainly help you in relaxing your eyes; I know it helped me, sort of. The retail unit would be coming up with a tempered glass, so you don’t have to worry about leaving smudges. And if you think that would affect the screen responsiveness, then don’t worry about that either. We thought the touch response of the display was pretty quick. Overall, the display has many things to offer and seems pretty competitive in the market. The pixel density was not up to the mark, but we liked what we saw on display. The one reason the display is good despite low pixel density was the Super AMOLED technology. It makes everything look way sharper and crispier than any LCD out there. I find Oppo’s ColorOS to be quite reminiscent of iOS. These days many Android smartphone brands are coming up with interfaces similar to iOS. But if you’re familiar with Oppo’s custom launcher then it’s no biggie for you. 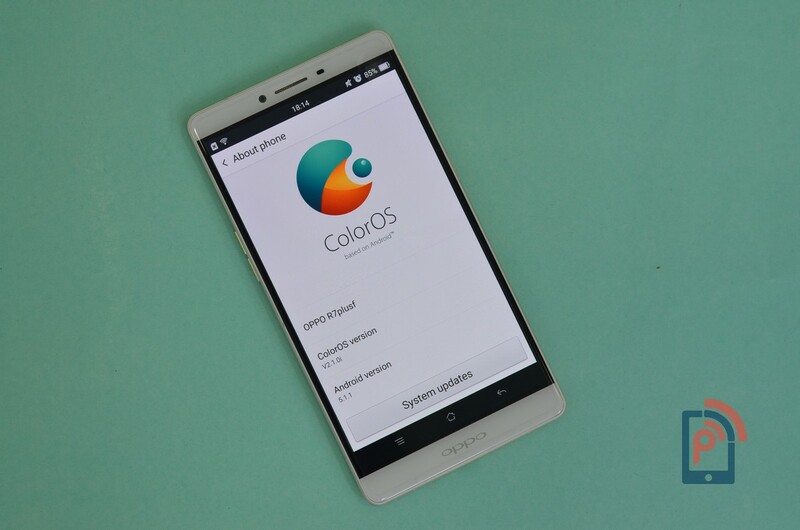 Just like popular UIs in the market, ColorOS has maintained its appearances. The system is powered by an Android Lollipop 5.1.1, which is the latest version of the operating system. You can’t possibly notice the difference in the interface of R7 and R7 Plus, even though both are powered by different OS. App drawer absence might be an issue for those who are used to app drawers, and even if the road comes to an end you can go with Google Now Launcher or any other alternative launchers from Google Play Store. Get past this thing and ColorOS is a pretty interesting Android skin. The most hated things on the Chinese Android skins are their bloatwares. But fortunately, R7 Plus doesn’t irritate use with such apps. Instead, you’ll find some useful apps like Back & Restore, O-Cloud, and Security Center. Other than Google stock apps you also get some tools like Sound Recorder, Kingsoft, Download Manager, Compass and few more. There is a theme store app that allow you to completely change the appearance of the system, from icons to wallpapers, everything can be changed with this app. You get offline as well as online themes access on it. Multitasking part is pretty much similar to what you see on iOS. Long press the menu button, and you’ll see the list of recently opened apps. Though, I didn’t like switching between the apps, because it’s sluggish. Despite having good free RAM availability on R7 Plus, the multitasking wasn’t good. I blame ColorOS for that. Talking about the internal storage on the device, we have the 32GB variant with us, and it has around 25GB of internal storage free on the device. If you’re worried about the storage, then you don’t have to. The R7 Plus offers support for microSD card up to 128GB. Additionally, you can also attach an OTG drive on the device. The trick is to enable the feature from Settings area. 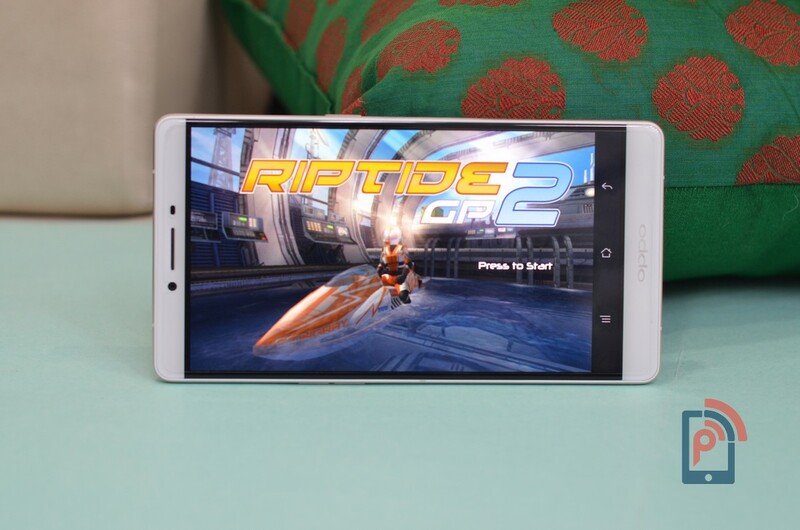 The large screen sized R7 Plus is powered by a 1.5GHz Qualcomm Octa-core processor, alongside is the 3GB of RAM. Opening up the apps was quite swift on the device, as Snapdragon 615 chipset has a reputation for being quite snappy in performance. This little guy is the powerhouse of performance, especially with ColorOS being optimized for faster launch and boot times. I didn’t go easy on the device while using it as my daily driver. We have purchased many heavy games to test out the gameplay on devices. We utilized that on this handset too and moreover who doesn’t like games. Even though, when ColorOS got heavy, the sailing was pretty smooth on games. The SD 615 has a bad reputation of heating a lot, but we didn’t have that issue. Although, when gameplay went continuously for more than 30 minutes, there was a considerable increase in degree heat. Moving on to the benchmarks on the device, we tested the potential of the device on benchmarking apps like Antutu and Vellamo apps. The device scored around 38000 on the Antutu benchmark, which is not a great number for an SD 615 chipset. While on the Vellamo app it got metal score of 1180 and multicore score of 1856, which are not that great, but we it was anyway on par with other SD 615 processor. The large real estate on screen makes it a good browsing device, moreover, the rendering of pages is quite fast with the default browser. The screen is responsive; we noted that in our display section talks. But the important thing to notice here is that whether the Zoom-in and Zoom-out operations are being performed correctly or not. We loaded desktop versions of our website and found that it’s quite snappy to browse desktop sites on this large screen smartphone. Just under the camera module and flash, you’ll see a fingerprint scanner on the back of the device. It wasn’t convenient place to put the scanner. Usually, I don’t prefer fingerprint scanners on the back of the device, because it doesn’t make sense. I would need to pick up a device to unlock it every time it is reclining on my desk. And most of the time over the day, it does lie on the desk. Though, talking about the performance of fingerprint scanner, it was impressive, as soon as I put my finger on it, the device was getting unlocked. No delays or lags experienced yet. Note you can add up to five fingerprints at a time. Oppo is known to offer some greatest camera modules on their smartphones and with R7 Plus it has continued that consistency. There is a 13-megapixel Sony IMX278 sensor present on the rear side of the device. It is accompanied by the dual LED Flash and Laser-auto focus. The Schneider-Kreuznach optics is used on the camera module, the lens used on rear camera has f/2.2 aperture, which isn’t best, but then again camera on the iPhone 6s have the same aperture number. The rear camera offers impressive captures during daylight, and I like the color accuracy of the outputs as well. The 4160 x 3120 resolution captures are quite sharp and offer plenty of details. Besides, the dynamic range was outstanding, there is an UltraHD mode as well that can capture photos in 5824 x 4368 resolution. The autofocus on camera was pretty spot-on for average object distance but struggled a little during macro shots. We were also impressed with artificial light captures as the details and white saturation balance was excellent. The low-light captures are pretty decent, and you might like them under dim light conditions. But when the night turns darker it gets hard to capture any details in the normal mode. That’s when the HDR mode dives in for help, but that too isn’t good enough to save the low-light captures from drowning. You understand the reference, right! The lens isn’t big enough to capture good low light images even with the software enhancements. Though, images turned out to be good in some low light situation with the help of artificial light. In terms of the software, the camera app has a pretty simple interface, which is clearly inspired from the iOS camera app. When you hold the device in landscape, you’ll notice there are icons on the left and the right corners. The shutter button is close to right hand while accessing gallery and changing modes is also easy. You can switch to front facing camera by just tapping on the icon present at left top corner. Talking about the front facing camera the R7 Plus has an 8-megapixel OmniVision OV8858 camera that offers some incredible selfie shots. We tested out the front snapper in many conditions, while it impressed us in the broad daylight condition with color accuracy and a great amount of detail. The company isn’t touting it as a wide-angle lens, but it does felt like there was quite the room when we captured a group selfie. What comes as an advantage to a large screen size, a big fat battery! The bigger sibling of Oppo R7 houses a massive 4100mAh capacity battery. This was a sure shot in terms of battery life because of the gigantic battery. I played a lot of games and was on a spree to watch Casey Neistat’s Vlogs because large display offered great viewing experience. With all that usage, I got a screen-on time of more than 5 hours, which is better than what I initially got on the Samsung Galaxy Note 5. Though, it wouldn’t be a fair comparison, so I’m stopping that here. Moving on with the standby talk, the battery offered me staggering a week’s standby time. Yes, you read that correct. Note that during standby time I only used it as my backup device. But all the social apps were present and whenever I used the device it was either for the camera or the music consumption. In extreme emergencies, you can either find a power unit to a charge your device for 5 minutes, which would give you around 2 hours of call time. Or you can either go with a Super Power Saving mode when you have very less battery available. This would increase the standby time by restricting most operations of your smartphones. Basically, it would transform your smartphone into a feature phone. The fast charging on R7 Plus is possible due to VOOC Charging technology that company incorporates on their device. Overall, the device offers killer battery life that one would admire on an Android smartphone. Talking about the connectivity options on Oppo R7 Plus, there is an interesting setup done by a company with dual SIM capabilities. On both the SIMs you can access, 4G LTE networks simultaneously, there are very few devices in the market right now that offers such features. While talking further on this part, we tested out the 4G speed and thought it was on par with other 4G devices. These dual 4G capable SIM slots can house only nano SIM cards. There is a hybrid tray present inside the SIM slot on the right edge, which allows you to either use two nano SIMs at a time or use one nano SIM and a microSD card. Moving on to the call quality on the device, it was quite clear on both the ends, thanks to the setup of two microphones; one on top edge while one on the bottom edge. Another set of connectivity features includes Wi-Fi, Bluetooth 4.0 and GPS. It would have been nice if the company has added IR Blaster as well. One can only wish so many things, right. The Oppo R7 Plus isn’t really a high-end smartphone but is certainly priced in that range at Rs 30,000. Now considering there is nothing largely wrong about the device, the metal made smartphone should be a good choice for a certain set of users. Like it offers good performance, optimized UI, insane battery life, and ample screen to enjoy videos on the go. For those reasons only, you could invest in this device. But if you have a budget of 30K, then you got plenty of options that are far ahead in specifications than R7 Plus. Such handsets are OnePlus 2 and Samsung Galaxy A8, moreover, there is new entrant from Motorola, the Moto X Play that beats the odds with its great specifications with similar processor and much better camera on paper. Note that we haven’t used new Moto device as our daily driver, so we can’t blindly suggest you to go with it.